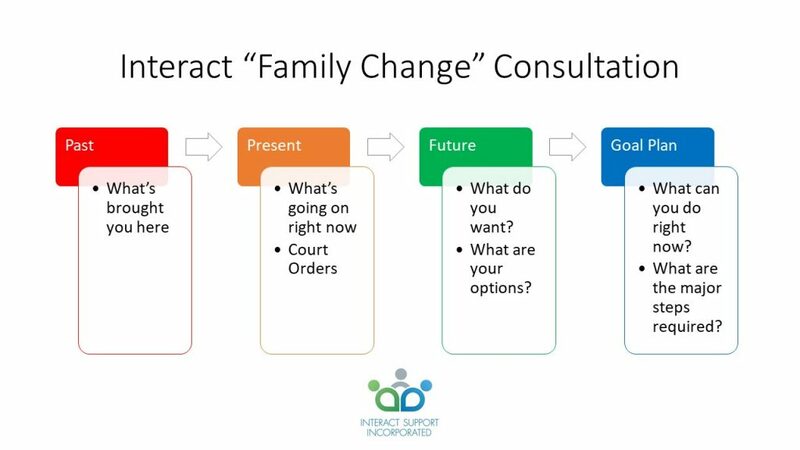 What is an Interact (Family Change) Consultation? Family Law means Family Change. When you come to the end of a marriage or de facto relationship there are going to be a lot of decisions you need to make. When families change due to separation and divorce it can be overwhelming for everyone in the family. This overwhelm can cause confusion, anxiety about the future and bring out less than your best behaviour. Kids stuck in the middle of this are dealing with their own feelings of loss and fear about their future and their experience is made much worse if one or both of their parents are not coping. We’ve created the Interact Consultation (Family Change) to help reduce the overwhelm and anxiety about the future by helping people to understand their options and make a plan to achieve the best possible outcome in their specific situation. As a family law professional working with people going through separation and divorce one of the biggest issues I encounter is the absolute confusion the people feel about their options and what is the right choice for them from the options. These are just a small sample of the many questions that people going through the family changes related to separating have. What we discuss during the Interact Consultation is based on the reality of your situation rather than what you hope or wish was true. We don’t tell you what to do. We ask you what is going on and then discuss your options with you based on your particular circumstances. The options open to people who have just drifted apart over the years and decided to end their marriage are going to be very different to those for someone who has escaped a violent and controlling relationship or who is unable to accept that the relationship is over and has been served with a family violence order to stop them directly contacting their former partner. We work with people at any point in the spectrum and help them to understand their options and make informed choices about what to do next. Why have an Interact Consultation? An Interact Consultation is a meeting with a Family Law Professional called a Family Dispute Resolution Practitioner. They are a mediator with additional training in the family law system at the post graduate diploma level. That means they understand the system, although their job is to help people to make their own decisions about their children and stuff. The role that family lawyers often do which is to guide people through the court system where judges make decisions about your children and your stuff. We, a collaboration of lawyers and family dispute resolution practitioner mediators, established Interact Support to help and support people no matter where they are in the Family Law Journey or what path they need to take to achieve their post separation goals. An Interact Consultation is facilitated by a Family Dispute Resolution Practitioner because they are more likely to be able to work with you to clarify what matters to you and not just what the letter of the law says. Deciding what to do is a value judgement based on what you value. Going to court in order to get a slightly higher percentage in your property settlement than you could get in a mediation may be worthwhile to you or it may not be when you consider the cost of going to court and the amount of time it will take. The bottom line is you have an Interact Consultation if you are feeling confused about what to do. What happens in an Interact Consultation? It is an individual session (usually takes an hour) made up of four stages. Stage two looks at what is happening right now and anything that urgently needs to be resolved. Your practitioner may discuss referrals to services offered by Interact Support or others at this stage. Stage three looks at what you want for the future for your family. Your practitioner will help you to look at the reality of your situation and the options available to you in a tailored way. Getting specific, good quality legal advice is highly recommended when on the family law journey. Without it you can only make emotional, uninformed decisions that you may later regret. With good quality advice you can make informed decisions weighing up the cost / benefits of your various choices. Stage four looks at your goal and the plan that has been coming together throughout the session. Our goal for the session is for you to leave with greater clarity about what you want for your family longer term (12 months from now) and also the short and longer term steps that are going to be needed to achieve that. Do you provide me with legal advice? No. The intention of the Interact Consultation is not to provide you with legal advice. Even if the consultant is a lawyer they will not be providing you with specific legal advice in this situation. Your practitioner will provide you with legal information and answer your questions about the family law system so feel free to bring along any questions you have. Often getting different answers from different people and the research you do on the internet makes it really confusing. Your practitioner will be able to clarify things based on the current Australian Family Law System. If your questions are a request for specific legal advice they will help you to prepare to talk with a lawyer and get that legal advice you need. How do I book in for an Interact Consultation? You can book in for an Interact Consultation online – https://interact.support/product/interact-consultation/ the service costs $198 if you earn over $40,000 a year. Not sure if an Interact Consultation is right for you? Use the Contact page to request a call back or email your questions.